Third, if you have not already done so, apply for at least one trade mark to your national intellectual property office. In Europe for Community Trade Marks (CTMs), it is the OHIM. In passing, OHIM.com is cybersquatted: how ironic! : the official trade mark site for Europe doesn’t have its proper domain name, which is a testament to the dog-eat-dog nature of the web with little practical control. Obiter, I’m a big fan of the book and blog BabyBarista and the Art of War. Sun Tzu and the Art of WardblawG might follow, or maybe How to make Blawgs and Influence People? Afterall, commercialisation of IP is the bread and butter of the IP lawyer. 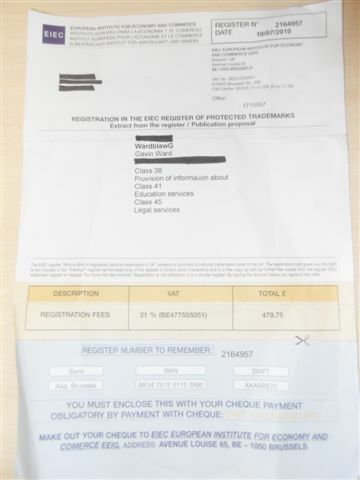 Note that the European trade mark registry is NOT the EIEC, which managed to “earn” several thousand pounds from a good entrepreneurial business friend of mine, and which, despite having no apparent official or valid purpose, still manages not to represent itself properly and which had the cheek to send an invitation to me asking for almost £500 to be paid to the EIEC to do hardly anything, after my trademark application was published in the UK IPO TM Journal back in July. EIEC, thanks for pretending that you can offer trademark protection throughout the EC, while having business managers hit themselves on the face when they realise, after paying your invoices without reading your small print, that they still have to apply to the official trade mark register in the EC for actual legal protection. From a Google search, “EIEC is a scam” is a pretty common listing. See, for instance, a full, comprehensive list of trade mark scams, old and new, from Lisa Lennon of Gilbert + Tobin. See also an online prominent warning against EIEC’s “business”. To apply for a trademark in the UK, you need to submit your application to the UK IPO. They accept electronic submissions now which are highly recommended. The time it takes you to prepare the application really does depend on your business. 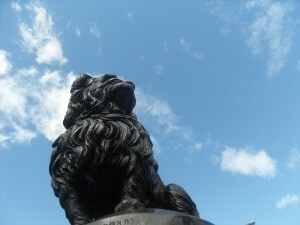 For me, it took about an hour, principally because I knew how to do it already, following fellow blawger Professor Jeremy Phillips’s example with his IPKat registration, for which he used Olswang solicitors. The official fee was £300: £250 for 2 classes, plus £50 for one additional class. The expressions web log and blog were used. Afterall, you might as well protect yourself in those most relevant of classes of products or services. For more complex or unique businesses, professional trade mark agents or “attorneys” as they are sometimes known, are recommended. Marc Lieberstein now of Kilpatrick Stockton LLP here is to be recommended highly in the States. Williams Powell including, in particular, John Reddington is to be recommended highly in the UK. See the IPKat’s UK trade mark registration and WardblawG’s UK trade mark application for further inspiration and ideas. If you are in any doubt about trade mark registrability, research further or seek professional advice from a lawyer, brand protector or trade mark agent. In my experience, trade mark agents are most useful when registrability of your brand as a trade mark is clearly problematic, when you need to overcome objections or field queries from an examiner, or when you have a large portfolio of trade marks to register and maintain.